2018 NSAC Prevention Focused Workshop Recordings are Here! The 2018 National Sexual Assault Conference, “Bold Moves: Ending Sexual Violence in One Generation,” was held in Anaheim, CA, August 29-31, 2018. Missed a workshop at the 2018 National Sexual Assault Conference? Want to revisit a key highlight from a presenter? 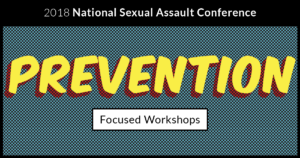 Check out our recordings from the following prevention focused workshops from the 2018 National Sexual Assault Conference!